Welcoming a New Year and New Friends! Happy New Year from the Tesori Family Foundation! We’ve been really busy the past few months and apologize for not posting sooner! Webb and Paul kicked off the 2017 portion of the wraparound season this past week in Honolulu with a great showing and ultimately a a T-13 finish! Paul racked up a bunch of miles for our A Mile In My Shoes Campaign and just a few weeks ago, our little Isaiah turned 3!! Can you believe it? Yeah, neither can we! He’s such an incredible light in our lives, and we couldn’t be more thankful that God trusts us with him every single day. We wrapped up an amazing year for the foundation with our annual 3-21 Golf Classic which raised more than $37,000 this year for our foundation programs that give back to the Down syndrome community! We are so humbled and thankful for all the support that allows our programs to serve more and more families each and every year! In just a few short weeks, we’ll have all our numbers together for the entire 2016 calendar year and can’t wait to share with you the impact you’ve all made through your support, your prayers and your gifts to the foundation. Going into 2017, we ask for your continued prayers for wisdom for our family, our board of directors and our entire foundation team as we prayerfully look for God’s guidance for the year. 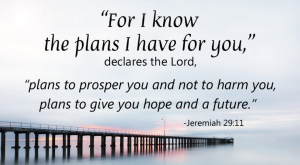 We’ve got so many great things planned and tweaks to make to existing programs to make them even more beneficial to the kids and families served by our foundation, we just want to make sure we’re still enough that we are following God’s plan for us! On that note, we wanted to start the year by telling you less about US and more about YOU — the people we’ve met through the foundation. We’ll be featuring guest blog posts through out the year to tell stories of more of you! And just as we were considering this, a brand new family reached out to us from ALASKA of all places, telling us they’d heard about us online, and sharing their story with us. We’ve asked them to share their story with you, our friends, so that you get to know some of the great people behind the scenes who making this foundation possible. 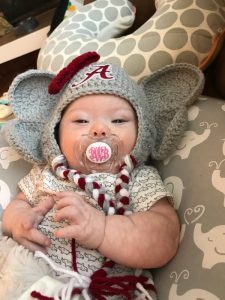 Please welcome baby Palmer and her family to the Tesori Family Foundation “family” and be praying for their growing family as they navigate some upcoming changes! Our first child, a gorgeous little girl named Palmer Britton Ward was born on November 16, 2016. Her mom, Brooks, was born November 18, 1985. Little did she know that exactly 31 years from her mom’s birthday she would change our lives forever. November 18, 2016 was the day that the doctors would let us know that the test results came back positive and our daughter has Down syndrome. It felt like we had smashed into a brick wall. We were already in the NICU as Palmer was diagnosed with pulmonary hypertension and her patent ductus arteriosus was closing as it should, yet we thought it couldn’t get any worse. We were oblivious to Down syndrome. We knew absolutely nothing. We looked on the internet and found a thousand different websites, a list of million statistics and it all seemed to be written in a foreign language. After coming to the realization that there was absolutely nothing we could’ve done differently to change the outcome, we sat down and we let family and close friends know about Palmer. That night, I left the NICU and headed straight to Barnes and Noble in search of a book to teach me about Down syndrome. I found a book titled “The Parent’s Guide to Down Syndrome”. I went home, let our 3 dogs out and I opened it up and began reading. What I was reading was absolutely amazing. I didn’t want specifics or someone telling me exactly how it’s going to be and this book was simply telling me what other parents had experienced. What I was reading didn’t seem to fit the idea of what I thought Down syndrome was and I was finding out otherwise. Never having been exposed to Down syndrome, I only knew the very little that I had been made aware of through a documentary on television that I caught a snippet of while changing channels. While in the NICU, I would read aloud to Brooks and we would check out the websites they recommended visiting for new parents. We quickly started to learn that there is an incredible amount of families, support group, campaigns, foundations, and information readily available to help at any time. We learned really quickly that we’re not in this alone. We spent countless hours trying to figure out where to begin. Everything just sort of fell into place. On December 5, 2016, all of Palmer’s medical issues had vanished. We were being discharged from the NICU without any oxygen support or medication. Palmer had been an absolute trooper through everything; the countless shots and labs drawn, to the feeding tube and yeast infection, she was absolutely amazing and we were heading home. Once we were home and settled, the appointments started. 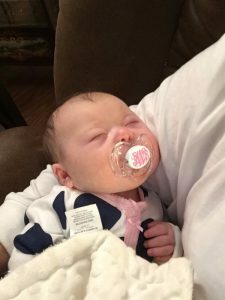 We were informed of all of the different kinds of therapies that Palmer will have to go through, but didn’t think it was going to be at a month old. 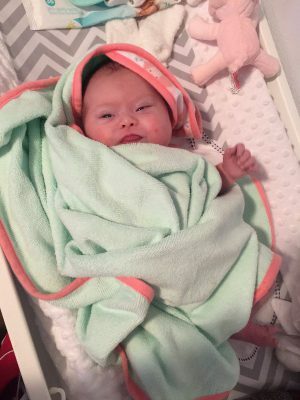 The doctors and nurses told us that she’ll have low muscle tone and she’ll most likely develop all of her motor skills later than that of a baby without Down syndrome. Palmer didn’t like that, so she said “watch this”. Palmer just finished her 2nd physical therapy session and is doing absolutely stellar. The physical therapist is amazed every time she sees Palmer. The speech therapist didn’t even want to come back by after his first session because of how well she was doing. He didn’t see a need for it, so he just phones it in now. She’s already rolling over from her tummy to back and she’s getting stronger every day. Brooks and I come from sports families. We were both raised around and playing sports. While scouring the internet to find ways to become more involved, I came across The Tesori Family Foundation website. As an avid golfer, I was specifically looking for golf tournaments benefitting and advocating Down syndrome. I clicked on the 3-21 Classic to find out and to search out the date, location and time. I then began to browse the website and came across the A Mile In My Shoes campaign. I told Brooks about it and we decided to pledge knowing that it’s for an amazing cause, plus it gives me a reason to watch more golf. We’ll be watching for and cheering on Paul and Team Simpson. We’ve been overwhelmed by the amount of encouragement and support that we’ve received. Shortly after pledging, we were reached out to via email, asked about Palmer and an immediate connection was made. The Lord has blessed us tremendously and has sent nothing, but amazing people into our lives ever since Palmer’s birth. We know that it’s not going to be easy. We know that it’s going to get tiresome. We know that we’re going to have our good days and our bad days. Most importantly, we know that God has a plan for Palmer and we can’t wait to share it with you all as she takes us on this incredible journey of hers. Let the fun begin!